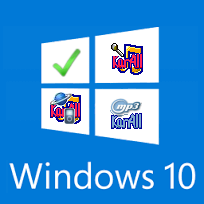 Due to the complexity of the processes by it is made KarAll (some files are compressed) could produces any reports about virus or malware, but only by some antivirus. These reports are to be understood as false positives. In fact, many other famous antivirus can not find anything or correctly detects and reports used compression systems. We guarantee that the software produced by us is completely free from viruses or malware of any kind. So our advice is to locate files blocked by the antivirus and include them in the list of exclusions. to start the download process manually.